Requirements were INTRODUCED as a new merit badge effective April 16, 2014. This merit badge has REPLACED Computers merit badge. For the Computers badge requirements, Click here. before the official announcement and release of the merit badge and pamphlet, April 16th was the official "Earn Date". During 2014, a Scout could continue—or begin work—using the old Computers merit badge requirements (Click here) and the old pamphlet. Otherwise, he could switch to—or begin work—using the new requirements as stated in the 2014 Boy Scout Requirements book for Digital Technology (which replaced Computers) (below) and the new merit badge pamphlet. If a Scout elected to use the old merit badge requirements and pamphlet, he may continue using them until he has completed the badge. See Guide to Advancement topic 7.0.4.3. This badge is a replacement for the Computers merit badge, which has been discontinued. However, Since it is a NEW badge, with substantially different requirements, Scouts may earn Digital Technology, even if they have already earned Computers. Show your counselor your current, up-to-date Cyber Chip. Give a brief history of the changes in digital technology over time. Discuss with your counselor how digital technology in your lifetime compares with that of your parent’s, grandparent’s, or other adult’s lifetime. Describe what kinds of computers or devices you imagine might be available when you are an adult. Explain to your counselor how text, sound, pictures, and videos are digitized for storage. Describe the difference between lossy and lossless data compression, and give an example where each might be used. Describe two digital devices and how they are made more useful by their programming. Discuss the similarities and differences between computers, mobile devices, and gaming consoles. Explain what a computer network is and describe the network’s purpose. Explain what a program or software application or “app” is and how it is created. Name four software programs or mobile apps you or your family use, and explain how each one helps you. Describe what malware is, and explain how to protect your digital devices and the information stored on them. Describe how digital devices are connected to the Internet. Using an Internet search engine (with your parent’s permission), find ideas about how to conduct a troop court of honor or campfire program. Print out a copy of the ideas from at least three different websites. Share what you found with your counselor, and explain how you used the search engine to find this information. Use a Web browser to connect to an HTTPS (secure) website (with your parent’s permission). Explain to your counselor how to tell whether the site’s security certificate can be trusted, and what it means to use this kind of connection. Do THREE of the following. For each project you complete, copy the files to a backup device and share the finished projects with your counselor. Using a spreadsheet or database program, develop a food budget for a patrol weekend campout OR create a troop roster that includes the name, rank, patrol, and telephone number of each Scout. Show your counselor that you can sort the roster by each of the following categories: rank, patrol, and alphabetically by name. Using a word processor, write a draft letter to the parents of your troop’s Scouts, inviting them to a troop event. Using a graphics program, design and draw a campsite plan for your troop OR create a flier for an upcoming troop event, incorporating text and some type of visual such as a photograph or an illustration. Using a presentation software program, develop a report about a topic approved by your counselor. For your presentation, create at least five slides, with each one incorporating text and some type of visual such as a photograph or an illustration. Using a digital device, take a picture of a troop activity. Send or transfer this image to a device where it can be shared with your counselor. Make a digital recording of your voice, transfer the file to a different device, and have your counselor play back the recording. Create a blog and use it as an online journal of your Scouting activities, including group discussions and meetings, campouts, and other events. Include at least five entries and two photographs or illustrations. Share your blog with your counselor. You need not post the blog to the Internet; however, if you choose to go live with your blog, you must first share it with your parents AND counselor AND get their approval. Create a Web page for your troop, patrol, school, or place of worship. Include at least three articles and two photographs or illustrations. Include at least one link to a website of interest to your audience. You need not post the page to the Internet; however, if you decide to do so, you must first share the Web page with your parents AND counselor AND get their approval. Explain to your counselor each of these protections and why they exist: copyright, patents, trademarks, trade secrets. Explain when it is permissible to accept a free copy of a program from a friend. Discuss with your counselor an article or a news report about a recent legal case involving an intellectual property dispute. Describe why it is important to properly dispose of digital technology. List at least three dangerous chemicals that could be used to create digital devices or used inside a digital device. 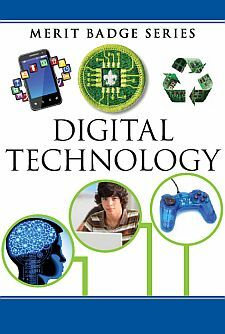 Explain to your counselor what is required to become a certified recycler of digital technology hardware or devices. Do an Internet search for an organization that collects discarded digital technology hardware or devices for repurposing or recycling. Find out what happens to that waste. Share with your counselor what you found. Visit a recycling center that disposes of digital technology hardware or devices. Find out what happens to that waste. Share what you learned with your counselor. Find a battery recycling center near you and find out what it does to recycle batteries. Share what you have learned with your counselor about the proper methods for recycling batteries. Investigate three career opportunities that involve digital technology. Pick one and find out the education, training, and experience required for this profession. Discuss this with your counselor, and explain why this profession might interest you. Visit a business or an industrial facility that uses digital technology. Describe four ways digital technology is being used there. Share what you learned with your counselor.